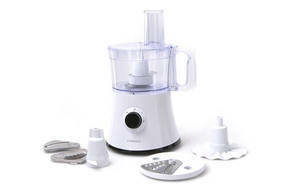 Snapshot: The Living & Co 500W Food Processor has 2 speeds, but no storage for attachments. How does it rate? Excellent at chopping breadcrumbs, emulsifying mayonnaise and kneading pastry. Reasonably stable on the bench. Compact unit easy to store. Smaller parts easy to clean in the sink.